Mary Bennet (Martha Brigham) and Arthur de Bourgh (Adam Magill) slowly discover they have fallen in love, with a little bit of help from their friends. 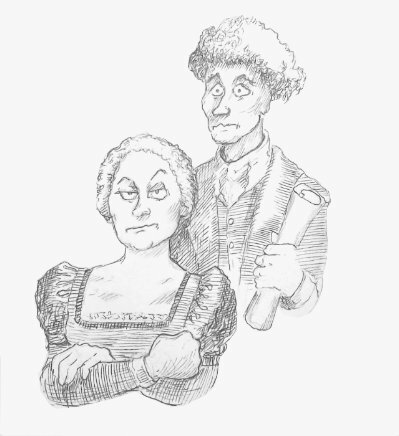 Caricature by Argyle C. Klopnik. From the Regency period set by Erik Flatmo to the Regency costumes by Callie Floor to the witty and subtle dialogue by playwrights Gunderson and Melcon, there is no question that this play is set firmly in the world that Austen made, and fans who have dreamed of a visit to Pemberley may well feel that there dream has come true. One will wonder, are the Darcy’s, Elizabeth and Fitzwilliam, true to the original creations? Well, we could have a debate. Joseph Patrick O’Malley’s Darcy is utterly charming, but perhaps insufficiently prideful, while Elizabeth Darcy (Cindy Im) seems to have mellowed perhaps more than one might expect. But this would be a silly quibble: they love one another, they love Pemberley, they love their guests, and their charm is intact. Don’t look too closely, and be happy, I’d say. The story cleverly contrived by Lauren Gunderson and Margot Melcon imagines a love affair between the unattached Mary Bennet (Martha Brigham), and the eccentric, nervous, perhaps even unmarriageable Arthur de Bourgh (Adam Magill). These two confused love birds will surely remind audiences of Shakespeare’s Benedick and Beatrice, and like those bickering B’s in “Much Ado About Nothing,” Mary and Arthur need all the help they can get before realizing they are in love. The help is willingly provided by the Darcy’s ad the Bingley’s, Charles (Thomas Gorrebeeck) and the very pregnant Jane (Lauren Spencer), although not without appropriately amusing complications. Erika Rankin is a hoot as Lydia Wickham, the third Bennet sister who has made an unhappy marriage but can’t admit to the facts, and Laura Odeh darn near steals the show as Anne de Bourgh, daughter of the deceased Catherine de Bourgh. Catherine’s overwhelming personality will be familiar to fans of “Pride and Prejudice” who will be pleased to find that, in this case, the apple has not fallen far from the tree as the mother is recreated by the daughter in a delicious comic performance. All ends well of course, and there is plenty of Christmas season magic along the way from the ambience of a gentle snowfall, to a shockingly inappropriate (to the Darcy’s surprised house guests) Christmas tree, to the gentle (and not so gentle) tones of the new-fangled piano forte through which Mary expresses so much. “Miss Bennet: Christmas at Pemberley” is a charming Christmas card of a production that will satisfy fans of “Pride and Prejudice” and serve to introduce others to the world of Jane Austen. Everyone involved should be pleased and proud, without prejudice. “Miss Bennet: Christmas at Pemberley” continues at Marin Theatre Company through December 23. For further information, click here. “Miss Bennet:Christmas at Pemberley” a rolling world premiere by Lauren Gunderson and Margot Melcon. Produced by Marin Theatre Company. Director: Meredith McDonough. Set Designer: Erik Flatmo. Lighting Designer: Paul Toben. Costume Designer: Callie Floor. Mary Bennet: Martha Brigham. Elizabeth Darcy: Cindy Im. Fitzwilliam Darcy: Joseph Patrick O’Malley. Jane Bingley: Lauren Spencer. Charles Bingley: Thomas Gorrebeeck. Arthur de Bourgh: Adam Magill. Lydia Wickham: Erika Rankin. Anne de Bourgh: Laura Odeh. Posted in Reviews.Tagged Adam Magill, Argyle C. Klopnik, Bay Area Theatre Reviews, Callie Floor, Candy Im, Charles Kruger, Erik Flatmo, Erika Rankin, Joseph Patrick O'Malley, Laura Odeh, Lauren Dungerson, Lauren Spencer, Margot Melcon, Marin Theatre Company, Martha Brigham, Miss Bennet: Christmas at Pemberley, theatrestorm, Thomas Gorrebeeck.